WPUF is the best frontend posting plugin out there. 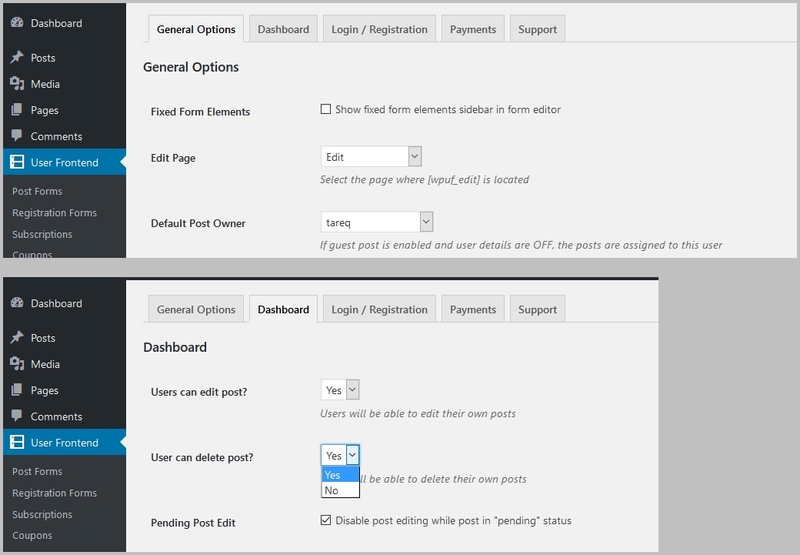 Along with this, it has powerful form building capabilities with custom post types. So, with its custom taxonomy and meta key feature, it is possible to use it as a frontend interface to post and manage products of your WooCommerce powered site. In this documentation, you will learn how to upload WooCommerce product from frontend using WP User Frontend Pro. After WPUF and WooCommerce is being installed and activated, WPUF will automatically capture the taxonomy, metas and post types from WC. Now you can easily create forms to upload product if you do not want to use the default backend posting of WC. Previously, users had to create WC product forms manually. But, the new WPUF provides more functionality and user experience. That's why it's very easy to create WC product forms. Just follow these steps. You will view available templates to choose from. These templates help you to create forms on the go. Click on the WooCommerce Product template. This will automatically create a WC product form with necessary fields. You can edit or delete any field you want. Copy the form shortcode by clicking on the form id and paste it to a new page/post. You are done with creating your own frontend WC product uploading form. You can watch this video to learn more about these steps. Please note that- WP User Frontend Pro does not allow to create variable products from frontend at this time. 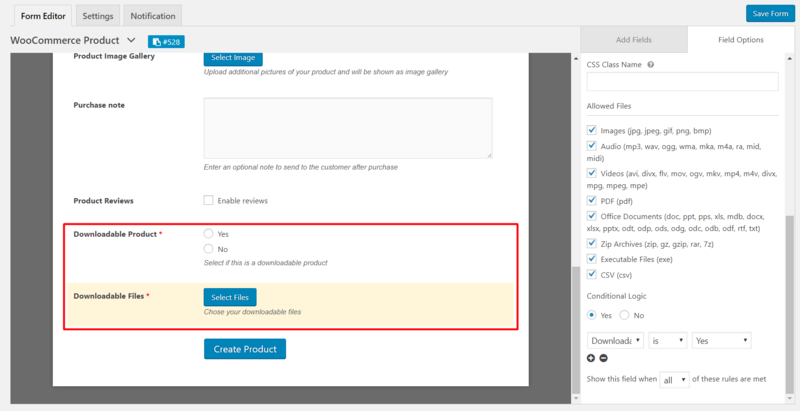 Previously, you had to custom code to get image gallery for WC product upload page. Now, User Frontend Pro automatically creates image gallery for your product upload page. 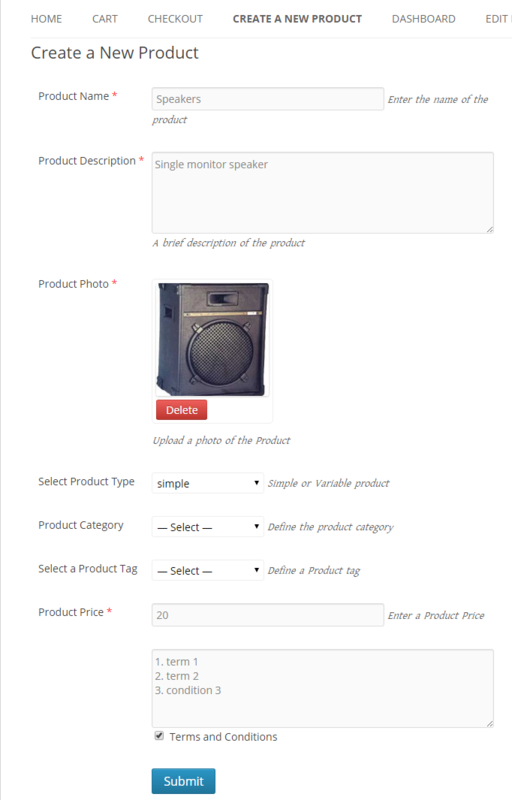 The WooCommerce Product Template has image gallery field included. So, you dont have to do anything extra. 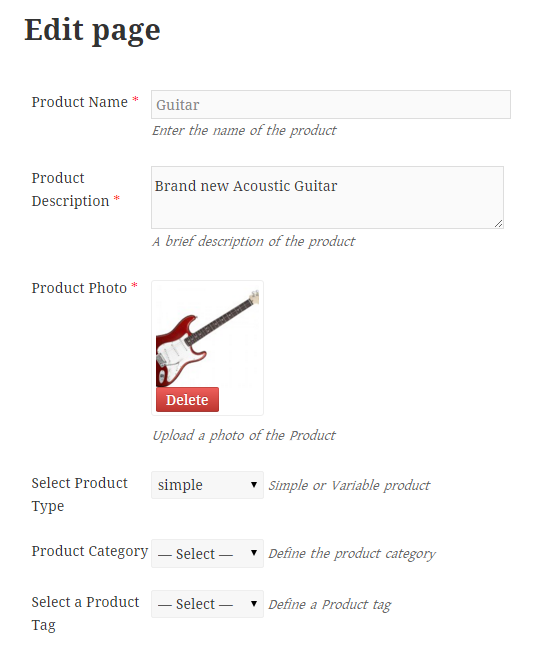 The new WooCommerce product form template also creates fields for downloadable products. You can let your users upload downloadable products with the product creation form as well. You can also add custom taxonomies for WooCommerce such as product_type, product_cat, product_tag, product_shipping_class if you want to add product type (simple, variation, downloadable etc), category, tag, shipping class if you want the user to set those fields out while uploading. When you are satisfied adding fields to the form hit save and copy the shortcode for the form. We will be needing three pages to get started with. The main page from where the user will create the product. We have already created this page. 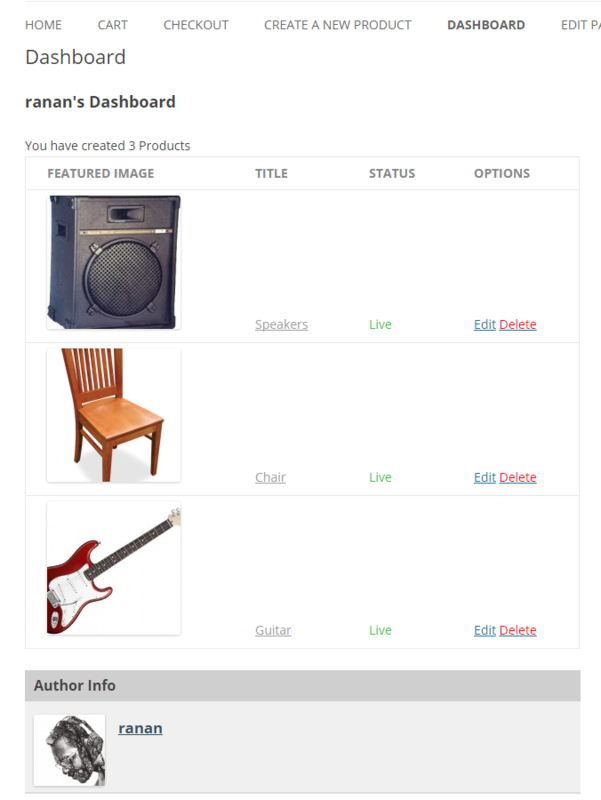 The Dashboard page will display all the products submitted by the user. This page will allow that user to edit or update the uploaded product if the admin allows the user to. The functions described will all be created by using forms and the forms will be added to the pages by using shortcodes. 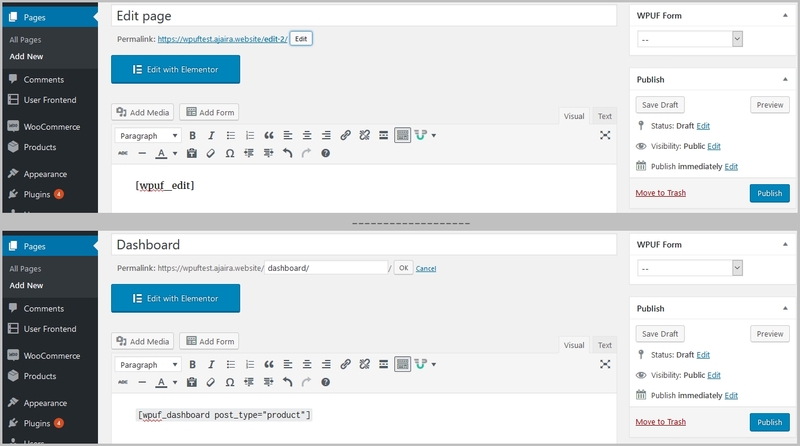 Create two new pages named Dashboard and Edit and simply paste the shortcodes in them. For Dashboard page use [wpuf_dashboard post_type="product"] and use [wpuf_edit] in the Edit page. Now go to WPUF → Settings → General Settings and to enable editing of products, select the page where [wpuf_edit] is located from the drop down menu. As you are done creating the form and the required pages, you can now test if it is working. Load the page and upload a demo product with product name, description and image or any other mandatory fields. After submission, please go to wp-admin > products and check if the product is created and all the information is updated. If yes, good! Now you can additionally test if it can be edited by opening the same product from the Dashboard page you created by clicking Edit button and adding or changing details of the product and then going to the backend again to check the details. You can add conditional logic for enabling or disabling menu items if the user is not logged in to your side for this product submission frontend. This will require some coding with your theme and developing skills.